Placements are the most embellished feathers in the graduation cap of any undergraduate in college. The enigmatic season witnesses anxious faces with eyes beaming with the hope of a promising future. The final year college students are seen all dressed in crisp white shirt, formal pants, well polished shoes without a speck of dust. The scene outside the library indubitably portrays the gravity of the situation, wherein future engineers are seen rehearsing their formal introductions and the answers of the well researched and anticipated questions. 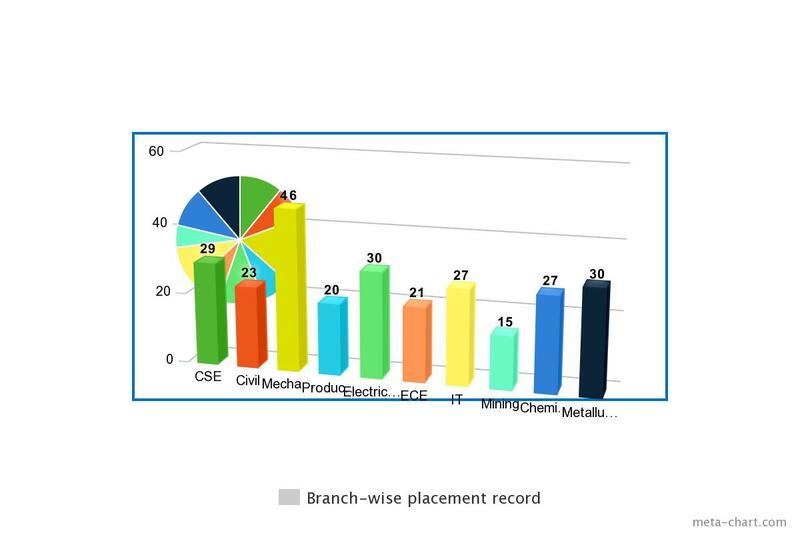 At the end of the placement season BIT Sindri has statistical record of 296 campus placements till date to boast about. For the past few years, the placements statistics have not been quite competent, but with the turn of tables the graph has taken a sharp turn shooting upwards. SOURABH SINGH CHAUHAN CIVIL JSW MUMBAI 5. INZMAMUL HODA METALLURGY JINDAL STAINLESS HISAR LTD. The statistical data of placements has revamped quite remarkably, rekindling the hope that BIT Sindri will reclaim its long lost glory. Speaking of statistics, we have leaped steps ahead; from 272 students being placed last year to a feat of 302 this year and the list is still in the making with the Mechanical Branch proving its might over others. Thanks Shruti for excellent reporting.Iwould like to express my heart felt sincere thanks and gratitude to my placement coordinators for their sincere and untiring efforts that makes this possible to to achieve glorious achievement and success.Special thanks to Shivam, Akash,Satyam , Balram. I am really grateful to you my boys.You are working hard till today with me to achieve the target 400 plus for 2019 pass students.I would like to extend my sincere thanks to my newly selected sincere and committed placement coordinators, who are working hard to convert each and every opportunity into grand success.It is my believe that hum honge kaamyaab ek din man mein hai vishwas.